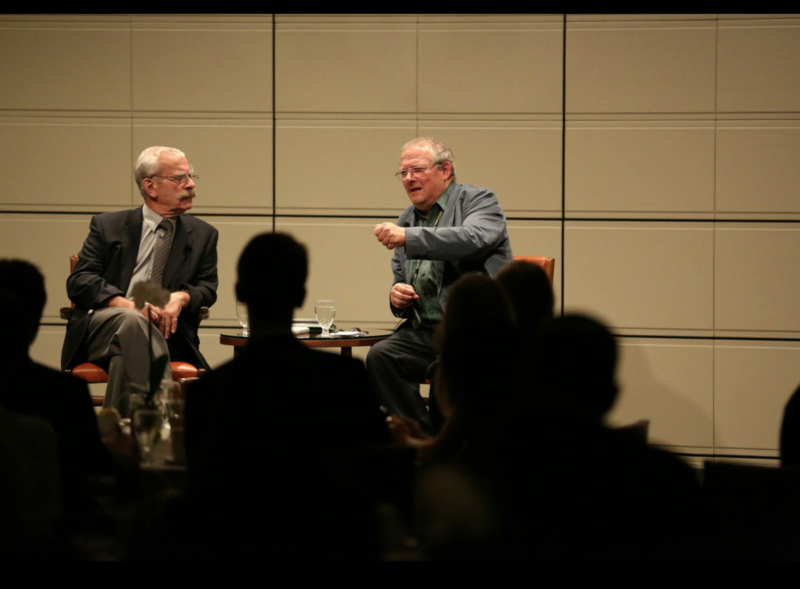 The revolutionary changes of the 1990s -- the collapse of the Berlin Wall, the Polish Solidarity movement's sweeping influence across the Soviet bloc -- are far from secure today, Adam Michnik told a large audience Tuesday night in the Marian Miner Cook Athenaeum. Michnik, the founding editor-in-chief of Gazeta Wyborcza and a leading figure (with Vaclav Havel, Lech Walesa, and others) in the struggle against Soviet totalitarianism, reflected on the gains and achievements of "Solidarnosc" as well as the unsettling, complicated conditions existing today in Poland and its surrounding neighbors. "We have a non-digestible past," he explained (assisted by translator Josef Sobelman). The elements of this past that continue to exert an influence on daily life include, he said, "border issues…ethnic nationalisms…anti-Semitism …and the position of the Catholic Church in Poland today." For many of Poland's Catholic bishops, in fact, Michnik said that the figure posing the greatest difficulty is their church's leader, Pope Francis. "What he says flies right in their faces," Michnik said, referring to extremist religious movements in Polish society clashing with the pope's more moderate views on issues such as homosexuality and divorce. "Francis speaks to the world inclusively … but what they want is to exclude." Michnik's dinner lecture was the second of two talks during his visit, which was sponsored by the Gould Center for Humanistic Studies. Earlier that day, Michnik surveyed the history of the dissident movement during a luncheon conversation with interviewer Jonathan Bolton, Professor of Slavic Languages and Literatures at Harvard University. Bolton is also a Milosz Institute Fellow with the Gould. While the Michnik-Bolton interview and parts of Michnik's evening lecture focused on his poignant memories of the struggle against totalitarianism ("We started in the 1960s when no one gave us any chance," he said, "We had on our side only the truth and the dream of freedom"), the audience was especially interested in what Michnik had to say about the current conflict between Russia and Ukraine. In Russia's actions in Eastern Ukraine, Crimea, and elsewhere, Michnik said he sees ominous parallels with Hitler's Anschluss movement, which annexed Austria and other regions with ethnic German populations into a united Germanic state. "Recently, the Duma passed a law that Russia has the right to intervene in any country where Russians live and that they feel are in danger," Michnik said. "Putin is counting on the weakness of the European Union and American foreign policy. He has been quite successful because slowly he is splitting up and dividing the countries of the EU." Putin's destabilizing effect, Michnik said, is also evident not only in Ukraine, but also in "Ossetia, Georgia, Moldova …wherever he can, he plants a bomb." He told the audience that Putin's actions in Ukraine clearly demonstrate that he is "not a run-of-the-mill European politician, he is a gangster." He used another World War II parallel to describe Putin's use of media to reach ethnic Russian populations around the world and stir up local hostilities. He called it "Goebbels-like propaganda," referring to Hitler's minister of propaganda, Joseph Goebbels. "Putin has awakened great Russian chauvinist demons," he said. "I believe Putin is a man who, if he has no facts, he simply pulls a knife or a gun."